That #TheWanForAnne video has gotten him 9GAG-famous. 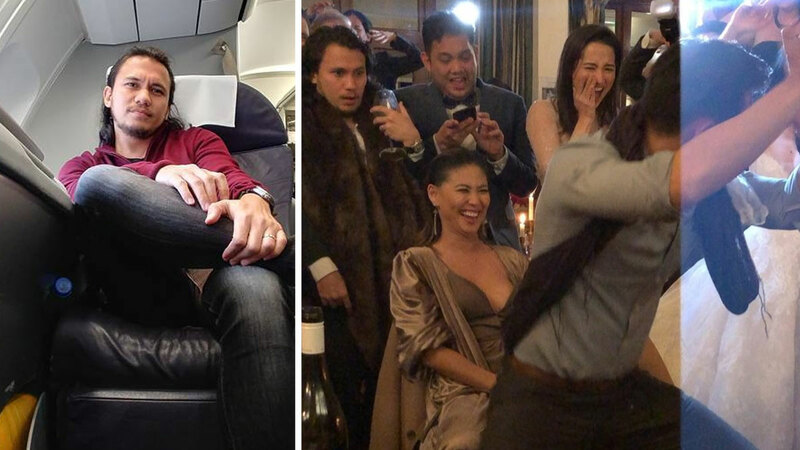 While we saw many tender moments on social media from Anne Curtis and Erwan Heussaff's intimate wedding in Queenstown, New Zealand, the couple's friends and family balanced out the celebration by channeling their wild side during the reception party. A video that featured one of the couple's guests, Spongecola vocalist Yael Yuzon, got an unexpected amount of attention online. During the exxxtra steamy Magic Mike-esque performance of host Marc Nelson for model CJ Jarravata, Yael's animated facial reactions were super meme-able that the video footage got reposted on 9GAG! We spoke briefly to Yael about his newfound internet fame and what was going on in his head during the performance: "It occurred to me that they were filming, but then again we were all just having a good time." He also added how everyone in the reception was just really into the partying: "It was a great party. Erwan sang 'No Diggity.' Anne sang 'I Love Rock N' Roll.' Grammy-worthy moments."